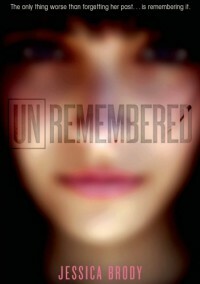 I had been aching to read Unremembered from the moment I read about it. I fangirled over the cover (which, coincidentally is not this one – but this one is uber pretty anyway), desperately wanted to read the story, and just yep. I wanted to read Unremembered immediately. Unremembered was pretty darn epic. Everything was SO different from what I had guessed it would be like. I was kind of expecting a bit of a sci-fi twist on the run of the mill amnesiac story, but it was so much more than that. So much more. It was not your run of the mill anything. It was purely and utterly unique, and in the most wonderful of ways. I don’t really know where to begin talking about Unremembered, especially without ruining any of the awesome surprises that Brody has included. I’ll start with the characters. Violet, our main character, is lost. Her memories are gone, she has no clue of who she is or who she was. She doesn’t know who to trust. She doesn’t even know how she ended up as the sole survivor of a plane crash that she, in all reality, should have died in. I liked how Brody wrote Violet’s confusion about her predicament. Her little ‘isms’ made me laugh. Like how literal she was with everything. For example, Cody (her foster brother) asks if she wants to go to some far off country because the internet connection might be better there. Violet says yes, and literally. I’m not anecdoting (yay for making up words!) that very well, but the scene was adorable. I think that Violet herself was adorable. The only thing that irked me a little bit was the focus on how beautiful Violet was. But I can kind of understand the fixation, now that I know the story’s secrets. Lyzender. Zen. ZEN. Aw, man. I feel another book boyfriend making the list. Zen is the epitome of a romantic and adorable guy who is dedicated to his girl, and willing to do anything and everything to protect her. In a non-creepy way. So many gold stars to Brody for creating a non-creepy love interest, and with no love triangle to boot. *starts dancing* When part of the reveal is, well, revealed, my heart broke a little for Zen. Everything that he had been through for Violet; to be with Violet. It was just heart-breaking and heart-warming at the very same time. The lesser main characters were also awesome. I especially liked Cody and Rio. I thought that they were developed really well, even though they didn’t have a lot of page time. I felt connected to them nonetheless. I thought that Violet’s foster parents were written really well – enough caring to make them nice people, but then ample freak-out-age to make them normal. The reveal was quite epic, as I mentioned before. I really did not see it coming at all. Which is great – I love being surprised by novels! It’s getting harder to find novels that still have that capability. But Unremembered does it, and does it well. I especially love a conversation that Rio has with Violet. About what makes us human. Our limbs, our heart, our brain? Our essence? How much can we lose before we are not human? Or is it what we gain that makes us human – experiences, emotions. I love how thought provoking this conversation was. It definitely had me wondering what I think defines a human. Whether or not it is their human body, or their human mind. And I cannot express how thankful I am that Brody was able to give me something to think about. When I read YA books, more often than not, I am engrossed in the story but as a story. About characters and worlds and settings that I love to immerse myself in when I want to escape from my own world. But when I can come across something that really makes me think - and about something important like this, I cannot help but be thankful to the author for being able to bring such a topic into a story. It’s quite amazing. Needles to say, I am eagerly anticipating the second book in this series, Unforgotten. I cannot wait to read more about Violet and Zen, and everything that they will be facing. Which is sure to be a lot of adventure and suspense, and of course, epic romance.